I’ve never been more excited about anything than being finally able to share some pretty amazing news! At the end of last year I have signed a contract with an incredible publisher – Octopus – and since then have been working on my first cookbook! Entitled Salt and Time: Recipes from a Russian Kitchen, the book explores the culinary heritage that I grew up with, delving into the intricate history of Russian, Siberian and Soviet cooking. It will feature dishes dear to my family, recipes that I’ve discovered in Soviet and pre-Revolutionary Russian cookbooks as well as my own contemporary takes on classic flavour combinations. It’s been an absolute dream come true to work with an incredible team at Octopus, my agent, Zoe Ross, as well as with a group of most talented women in the industry – Lizzie Mayson, Tamara Vos, Louie Waller and Charlotte Heal. Yes, I am particularly proud that this book has been created by an all-women crew! The beauty will be out on 7th of March 2019 but you can already pre-order it on Amazon. I met Melek under the saddest but also most meaningful circumstances – almost a year ago, at a funeral of a mutual friend, Mehmet Aksoy. For a really long time, Mehmet has been trying to put us in touch as he knew that we’d get along really well, for various reasons, not least because of our shared love of food. And so we have; in loosing a friend, I gained a new one. It’s been beyond special to work with Melek on a charity edition of KinoVino x Cook for Syria hosted in memory of Mehmet. While Melek has already occupied a special place in my heart thanks to her warm personality, her incredible food, which I got to taste on the night, made me fall in love with this lady even more! So I am really excited to share Melek’s interview here, not only because she is a very talented chef and writer, but also because her story, as well as the story of Kurdish (food) culture, needs to be told. What inspired you to start cooking? I don’t remember this being a decision. It was such an ingrained part of who we are and how we express ourselves. All of my earliest memories are to do with food – I remember very little about life in Istanbul but the pockets of moments in time I do remember all involve food. I remember the bread and yoghurt I was fed at my grandads funeral to comfort me. I remember the olive tapenade mum gave me when she would take me to a cleaning job at a wealthy family’s home…I remember the homemade candy she would make me out of sugar, rosewater and lemon. I remember the first time we moved to London and I was curious to open the jar of English mustard…only to be traumatized by the pain in my nostrils…I detested mustard for a very long time…until I loved it. Cooking was the way I got to spend time with my mum, it was the reason we would gather with family and friends, it was what dad did for work. It defined us in so many ways. It quickly became my way of connecting and making friends. After school my friends would come over on the way home to have one of my sandwiches…they were a bit mega. When I got older my place was always the place to come and eat. It was not you see, a conscious decision for a career…I studied history at university and was set to be a lawyer…but the opportunity came to have a space…to make a place where the community could come and eat…so I finished university and found myself with a café. I went the reverse way…when I looked up and saw I had a café…I realized that this would be what I would do…and everything else would spring from this. How/where did you learn to cook? Self taught; from mums, aunties, grandmothers…and from dad. From practice…from tasting…from exploring. If you want to cook …everything is your learning ground. Not one chef or school can be the master of all cuisine or cooking…so make friends, speak to strangers, travel…be a humble student and be inquisitive. A typical meal involves bread, butter, yoghurt, and grains…everything else is built around this…and a shepherd salad! – tomato, onions, peppers, parsley, cucumber…olive oil and lemon juice very liberally! What is the role of food in the Kurdish culture? For a people who are the largest ethnic minority without a country of their own…dispersed across the middle east and Europe…a nomadic rural people who were thrust into the urban cities…no ingrained written culture…no official records…how have we survived? How have we thrived with such a strong sense of our identity? We have embraced oral storytelling…through songs, through mythologizing our recent past, through poignant celebration, through dance, through our limerick, ….and our food. With the absence of official records and script…we use all other senses for testimony. Some foods have myths and stories around them…others or done for feeling or occasions. Your versions of recipes change with region and dialect…but there is joy in this contention…a battleground of connection and laughs. Food is survival. Our ceremonies and rituals that are brought to life with food, form the fabric our communities and are a way for us to stay connected with each other. It is also the way we have introduced ourselves and been initiated into the communities we have entered. Finally, the food industry has been our way to survive first moving to cities. Most Kurds know how to cook…and so it was the only thing we knew to do in new cities where other opportunities were not afforded to us. So next time you go and get a kebab…ask said kebab man what he did before…you might find an interesting story. What is the quintessential Kurdish flavour? Flat bread (‘Lavash’) – bread must come with everything – otherwise how you will you know you’ve eaten? Sun-dried tomato paste goes in to the base of a lot of foods. Garlic, burnt butter, lemon and grains…things that are hearty and rustic…things that can sustain you for hard labour! Kurds also love a breakfast spread any time of day for any meal- the kurds are famous for their breakfast spreads…we usually eat on the floor with a colourful water resistant cloth. We jewel with small dishes of fresh things. And cracked egg of some sort and fresh bread as the main feature. Always served with a concentrated potent tea. I have so many – but my second home is Song Que on Kingsland Road. Hands down the best Vietnamese in London. Its family run. The family are the sweetest, most joyous and hard working. The parents practice ballroom dance in the stock room downstairs in their spare time. Their daughter Sharlene practically runs the place and her fiancé and brother are also part of the team. Staf bring their babies and families and they all eat together. The Rare beef pho is my favourite. So fragrant and delicate in flavor. Not oily…a warm hug in a bowl. I love that it has a canteen feel… I love informal dining…it reminds me of my travels in Vietnam and has practically been a second home to me the past few years. Lemons Parsley and Mint : ) and everyone knows it. I love making a one pot dish. It would usually involve me braising some chicken or fish, adding a grain, some veg (whatever I have) and stock. And eating this in a bowl topped with some pickled beetroot and fresh mint yoghurt. Who is your culinary inspiration? I loved Anthony Bourdain and was so devastated when he passed. He understood that connection with food and the people who make it. He knew how to get into the fabric of a community. I love Jamie Oliver because he made food accessible and his passion was infectious…he made great food and made us believe we could make it too. My mum and dad…dad would come home late from work and would wake me up so we could eat together. Some boiled eggs with Aleppo chilli, tomatoes, peppers and bread and yoghurt. He didn’t like eating alone…This stayed with me…along with his ability to connect with people and never make language a barrier. Tell us a bit about the recipe you are going to share. I am going to share a filo recipe that is both humble and grand…what food should be. Its simple but a bit mesmerizing. I love when simple ingredients can make a magic dish. You can use shredded and off cuts of filo pastry that you have set aside. First make the syrup to set aside to cool. Combine all syrup ingredients, including the two orange halves, in a small saucepan. Bring to the boil and boil for 10 minutes. Remove from heat and allow to cool whilst you make the cake. Whisk all the ingredients of the cream together until thickened in texture and refridgerate. Preheat the oven to 180 C / Gas 4. Lightly rub a baking tin with olive oil. Roughly tear into filo into shreds, into the baking tin, and leave to dry a little while you prepare the remaining ingredients. Cut one orange in half, and slice that half into thin half-moons to place ontop of the cake mix the cake. Zest and juice the remaining oranges. Combine the rest of the cake ingredients including orange juice and zest intoa blender or food processor. Blend together for a few minutes until the mixture is frothy. Pour the mixture over the filo. Stir together gently and make sure it is thoroughly mized. Arrange the sliced oranges on top of the cake. Bake for 45 minutes, or until the top is golden and the filling set. Once out of the oven, immediately pour the cooled syrup over the hot cake. Set aside for at least 1 hour, till most of the syrup has soaked in. You can then place in the fridge to cool even more or serve warm. Serve a slice with a scoop of the cream and top with the pistachios and an extra drizzle of the syrup from the base of the tin. When pouring the syrup over the cake, ensure you pour cool syrup over the hot cake (not hot syrup over hot cake). This will ensure it is fully absorbed. Use a ladle and pour over slowly to ensure absorbtion. A woman’s place is in the kitchen? For many of us, nurture is associated with women. From mothers’ first milk to our grannies indulging us with weekend treats, our caregivers while we grow up are most likely to have been female. I was raised by three women in Soviet Russia during the 1980s, when a small apartment often housed several generations. This made for a powerful connection between me, my parents, grandparents and great grandmother. I learned from them; sometimes I felt that I too had lived through the Russian revolution, war and Stalinist terror, so vivid were their stories. My home education also included rich culinary traditions encompassing Russian, Ukrainian and Jewish cuisines, and my earliest and strongest culinary influence was my great grandmother, Rosalia. A Holocaust survivor, she fled Nazi-occupied Ukraine in 1942 and settled in Siberia where she lived until her death in 2003. She’d witnessed grave atrocities and great deprivation, but Rosalia was one of the gentlest and most generous people I’ve known. For most of her life, she worked as a cook in Soviet canteens – so while I would hesitate to call her a chef, she was definitely a feeder who continued to cook until her very last days. This love of sharing food was passed on to me. I hadn’t considered a career in cooking until four years ago. At the time I was working for London’s Russian film festival (I’d studied film before), but often found myself down the rabbit hole of Instagram looking at food. I saw people – including my Ukrainian friend Olia Hercules – making waves with their cooking. Having noticed the trend towards less formal dining experiences, I wondered whether there might be a niche for a cinema-inspired supper club, and KinoVino was born. We are all familiar with the paradox: acts of feeding are associated with women, but remain limited to the domestic realm, while professional cooking is dominated by men. But that is changing. The internet and social media have helped blur the boundaries between the private and public, and while the implications of this can be mixed, it’s definitely for the better when it comes to food – and to the visibility of women cooks. Look no further than Mazi Mas in Hackney to see a venture that’s training refugee women in London to put their home cooking to work in order to find employment and make a living. 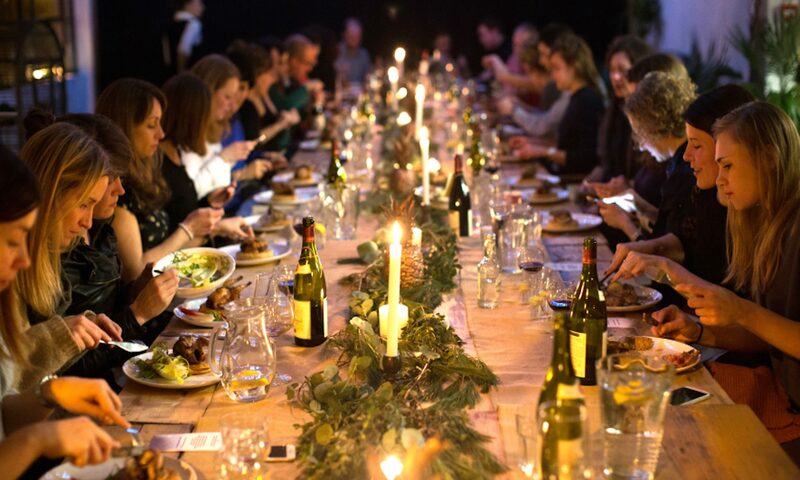 Meanwhile, Britain’s food scene, once defined by high-end dining, now includes supper clubs and street food, which offer opportunities for homely meals and, often, recreate the intimacy of a family dinner (and let’s not pretend these aren’t usually prepared by women around the globe). This is certainly what I try to achieve with KinoVino, which usually features women guest chefs. A very special energy is created when women make a meal and lay the table together. It allows us to establish a symbolic link to those who fed us at the same time as making our mark professionally. It was in this spirit that chef Romy Gill asked me to take part in her all-female charity dinner The Severn Sisters Feast in Bristol last year, in aid of Action Against Hunger. Rather than making a political statement, Romy wanted this dinner to be both a celebration of female talent and an opportunity for women in the industry to cook together. Each chef was invited to create a dish meaningful to her. The food that decorated the tables reflected the mixed backgrounds of the cooks in the kitchen: Ukrainian dumplings with British spuds, Siberian pickled mushrooms beside an Indian curry. The feast will visit London’s Borough Market on 4 October, adding Ghanaian and Greek cuisines to the repertoire. Inclusive, diverse, non-hierarchical, and seamlessly blurring the line between professional and domestic cooking: these are the hallmarks of women who work together in kitchens. Everyone is as uniquely qualified to cook and have an opinion about food as they are to eat it. My great grandmother would never have called herself a chef, but I think that if she’d lived in the food culture that I do now, here in London, she’d feel more proud of cooking to earn her keep than she did. Some 50 years separate Rosalia and me as two women making a living as cooks. She never had the chance to eat at a restaurant. So when I’m peeling onions with my kitchen comrades in Borough Market next week, she’ll be firmly in my consciousness. In our Instagram-obsessed world where the importance of the look is paramount, it’s so refreshing and inspiring to come across someone like Athena Calderone of Eyeswoon. Yes, that woman looks stunning, she cooks stunning food and presents it in the most elegant manner; and yet there is a lot more behind the picture-perfect surface; there is a real warm energy about what she does and a profound understanding of food – its textures, flavour combinations as well as its role in brining people together. The first ever dish that I tried to recreate in my kitchen a while back, literally as soon as I’ve read the recipe, was this number (roasted cauliflower with a punchy parsley-capers-jalapeno dressing). SOLD IMMEDIATELY! Since then this dish has become a staple in my home which I continue to adapt and alter from time to time, and which now feels like a good old classic of my own. Similar can be said about rosemary roasted grapes served atop of a crostini smothered in lemony ricotta. I could not believe my luck to have come across a treasure chest of unique recipes that is Eyeswoon! However, it is not only the elegance of the food and the adventurousness of her palette that drew me to this lady. I discovered her account at a time when I was feeling completely lost in my professional life, emotionally and intellectually depleted after finishing a PhD, creatively stifled after endless hours spend in the library and frankly panicked that I will never find a career that makes me truly happy. The way Athena spoke so honestly about her own creative trials and tribulations and the wisdom and warmth that oozed from the images and the text, made me feel … connected. It does sound insane and a tad scary (hello stalker) to say I felt connected to a person I’ve never met and only saw pictures of her food on Instagram. Yet that’s exactly how I felt and began to reconnect with myself, asking what does make me truly inspired and excited, and what do I feel happiest doing – cooking! That was the answer. Fast-forward three years, and here I am sitting on the floor of my living room, pouring over my very own brand new copy of Athena’s debut cookbook – COOK BEAUTIFUL. I have to confess that I’ve been religiously following all the behind-the-scenes moments of the book shoot on Instagram, so again, I have that odd feeling of reconnecting with an old friend while paging through my copy. Well, what can I say, in a nutshell – this book swoons the hell out of my eyes! From the food styling and photography, the the layout and the colour coordination of each chapter, this book is a pure aesthetic delight and I can only lament that this copy will get pretty disheveled as I will page through it time and time again. There is a beautiful simplicity to Athena’s style of food – it may be a recipe for roasted squash yet an addition of a crunchy topping or a zesty dressing elevates the dish immediately and makes your realise just how much flavour is packed into this elegantly simple plate. What I do love the most is Athena’s use of herbs – a lady who is not afraid of tarragon is the one after my own heart! As I turned each page I caught myself exclaiming some kind of a sign of pleasant surprise, fascination or curiosity – there is no single recipe in the book that is predictable, ‘trendy’ or similar to the one you’ve already read a few pages ago. However, they all feel like a part of one story for there is a coherence of style and theme running throughout. Seasonality guides the book’s form and content, but it’s also the charm of the author that makes you feel fully immersed in her beautiful universe. Each chapter is also complemented with tips on style and decoration of the dinner table. The decor obsessive in me is in heaven and just wants to dive into the page to sit at the exquisite table created by Athena. OK, let’s face it there is no way I will be able to afford to recreate these in exact detail ( I can only buy one set of cutlery from West Elm not six). But having said that, each chapter does strive to make these design ideas as accessible as possible, suggesting how to find a more affordable solution. Those who know me, have experienced how I love to add a little touch of something extra to the meal when gathering friends at home (not to mention when organising a KinoVino event) or even when having a simple dinner on a Tuesday night with my man (he often begs ‘can we just have a normal meal without all the theatre’). So if you are anything like me, COOK BEAUTIFUL will take your breath away. There is a lot to be said about the pleasure of looking at something aesthetically pleasing – it makes you feel inspired, moved, allured and fascinated, but also gives a sense of comfort, groundedness and connection. This and a lot more is what I experience when I explore Athena’s world. Supper club pioneer Alissa Timoshkina explains how a team of extraordinary female chefs came together for last year’s Severn Sisters Feast and why she’s so excited that the gang is getting back for a repeat at Borough Market. When one of your closest friends happens to write a stunning cookbook dedicated to Caucasus, you know now is the time for that crazy Paradjanov event you’ve always been dreaming of! And what can be better than the fact that your friend (I am sure you have guessed by now that I am taking about the beautiful Olia Hercules) happens to be a fellow Paradjanov aficionado and totally ‘digs’ what I want to say and achieve with the event. As soon as Olia sent me her notes after re-viewing the film through a KinoVino prism, I knew we are going to make something very special together (the fact that we have already produce two stunning KV gatherings over the last couple of years also helps, of course). We both knew that we wanted the food to be the artwork on the blanc canvas of the table. Olia’s menu echoed the imagery from the film and entered in dialogue with its themes and motifs. We left our menu deliberately obscure and poetic, so all our guests knew as they sat down to the table was the they were about to have: ‘Lavash. Earth. Salt’; ‘Creature of the Sea’; ‘A Beast with Pomegranates’ and ‘Celestial Peaches’. Perhaps this is a bit too wacky, but I am sure Paradjanov would have loved it this way. What the cryptic menu translated to was: ‘Caucasian bread with edible soil, tkemali beetroots and fermented baby aubergines’, ‘Pollack with walnut sauce, a spicy adjika relish, crispy shallots and micro herbs’, ‘Pulled lamb with herbs and pomegranates’ and ‘poached peaches, floating island, creme anglaise with a shard of apricot leather’. When you have a menu that is so unique and characterful, what do you do to set the right mood and how do you select the decor that does not overpower the food, nor overwhelms your guests. The easiest choice to make was the music – Georgian polyphonic singing is probably the most stunning human-made sonic creation that never fails to give me goosebumps. So that was the soundtrack of choice, played at a very gentle volume. For the lighting I decided to bypass the ever-present festoon lights instead dimming the light slightly with a few soft spotlights here and there. May be I am being a bit too poetic here, but the quality of the light in our space really reminded me of a warm sunset, which was exactly what we needed. Translating the magnificent world of Paradjanov is a challenge especially when you need to do it on a budget. So instead of going into a full on ‘recreation’ mode (which I think is a bit gimmicky and hence tacky), Olia and I chose several motifs from the film – feathers, apricots, clay vessels, flowers blooming from dry branches and well, of course, pomegranates. While I usually create two long tables with a uniform style running across them all, this time we had to set up 6 individual tables (namely as the event was oversold like crazy!) and I wanted to give each an original touch. So instead of creating one tablescape, why not create six! There was a sense of homelike cosiness in those seemingly different tables each echoing a certain motif of the film – the stripy fabric, that was used as a table runner as well as drapes over the windows, was inspired by one of the most striking dresses worn by the main character, while the stunning floral installations by WORM LONDON different on each table created a link to various visual motifs. Adding a bit of wackiness to the tablescape and giving my guests something to connect over as soon as they sat down, I have tied all of the napkins together with a red thread – not only did it stand out from the white tablecloth running across the perimeter of the table, but it created a symbolic link between each diner, a sort of a blood vessel connecting us all. The neat white space of the Calvert gallery created the perfect canvas for us to paint on, so my favourite part was a wave of feathers that ran all across the main wall and over some columns, creating a dynamic strike across the space, akin to the flock of birds in the sky. I always wonder how much of these details guests actually pick up on. But perhaps it does not matter that much, as I genuinely believe that the creative energy that goes into setting up the space creates the perfect setting in which our diners have a relaxed, cosy and joyous time. And that’s what really matters to me the most. I have to say that all of Olia’s KinoVino gatherings never fail to create that magical festive energy, where people keep eating and drinking past the official end hour of the event. So in a very ‘Like water for chocolate’ manner I feel that it is Olia’s beautiful personalty and passion for food that are the secret ingredients to a successful dinner party. And if I manage to enhance this experience be creating the right setting – well, that’s my mission accomplished! Pomegranate has to be my favourite fruit – its taste, its versatility, its looks and cultural significance; everything about pomegranate lures and delights me. Perhaps this has something to do with my mom craving pomegranate juice and drinking litres of it when she was in the last stages of her pregnancy, perhaps it’s connected to my love of Persian and Caucasian food, but give me anything containing pomegranates in any shape and form, and I will be ecstatic. This is why I instantly felt in love with the sound of Sumayya Usmani’s cocktail for our recent collaboration on a Pakistani edition of KinoVino – a pomegranate martini with Himalayan pink salt! Yes please! In a cocktail glass mush together the pomegranate cordial with pomegranate molasses and seeds, as well as mint leaves. Top with vodka, add a splash of soda water, some ice cubes. Give it a good stir. Add a twist of the salt and decorate with a few pomegranate seeds and a leaf of mint before serving! As soon as I opened Olia Hercules’ new book, Kaukasis, I was transported into a unique world of evocative memories, intoxicating flavours and insightful reflections. I almost hesitate calling Kaukasis a cookbook as it is so much more than that. It is a glimpse into a beautiful culture of the Caucasus, it is a travelogue documenting Olia’s personal journey and a portrait of so many wonderful people she encountered over the years of traversing Georgia and Azerbaijan. Yet above all it is a window into Olia’s own universe that encompasses her passion for food and wine, her love of people and her intelligent interweaving of personal stories and wider (political) histories. Her writing is thoughtful and elegant but also very quirky and humorous. Without knowing anything about the author, the reader can clearly sense an intelligent, warm and convivial person behind the text. Her stories to each recipe are little essays in their own right and I have enjoyed reading them as much as musing over the flavours and textures Olia so vividly describes. Coming to the end of the book with a feeling that I could go on reading more, I was delighted to find an additional section at the back featuring Olia’s essays about wine culture in Georgia, about her journey across the region as a child as well as the story behind the book’s title. This beautiful section, printed on black and white recycled paper, elevates the book even further from the ordinary recipe book, attesting to Olia’s special talent as a writer. Of course, Kaukasis would not have been the unique creature that it is, were Olia’s gift as a chef less impressive than that as a writer. She brilliantly summarises the essence of her approach to collecting and creating recipes in the introduction, drawing a poetic parallel to the stunning imagery on the cover of the book: it is a vibrant mosaic of seemingly random parts which come together to create distinct shapes and forms recognisable to all. And this is indeed true. Olia demonstrates profound knowledge of Caucasian food culture (a result of years of research and travels) and manages to inject her unique vision into classic recipes, creating perfectly balanced dishes that are at once contemporary and accessible, as well as unique and imbued with a sense of tradition. Olia guides her reader through various ingredients and explains how these could be replaced and adapted, which to me was a particularly attractive feature. It demonstrates Olia’s healthy approach to cooking – take your ingredients seriously but also give yourself creative license to experiment and explore. The range of recipes presented in Kaukasis makes this book ideal for home cooks and professionals alike. There is a great scope in terms of complexity and the skills level required to execute the dishes – from assembling a deliciously simple salad to delightfully time consuming and intricate dough work. But what’s most important to me, these recipes and Olia’s approach to food made me want to rush into my kitchen and start cooking. No matter what, no matter which ingredients, but just to cook so as to reproduce that intoxicating creative energy that Kaukasis so powerful emits. This is a beautiful feature that Olia carries over from her debut book, Mamushka, which inspired so many wonderful cooking and eating sessions in my kitchen. As well as epistolary and culinary creation, Kaukasis is also an aesthetic experience. A whole new review can be written just on the photography by Elena Heatherwick, while the lay out and the font exist in perfect harmony and complement the stunning imagery. In this day and age of very specific trends in food styling and photography, Olia’s and Elena’s work pleasantly surprises with its refreshing and original feel. The fact that all photographs were shot on film adds that beautiful nostalgic quality which in turn echoes Olia’s writing and enhances the overall slightly elegiac energy of the book. Authentic simple objects and settings add an important documentary feature while Olia’s elegant food styling and Elena’s unique colour scheme and lighting leave no doubt that these photographs are a work of art. I love the fact that many images in the book are not of the food and so paint a complete portrait of Olia’s world and vision of the Caucasus, and this is exactly what this book is about. Stunning portraits of the author, breathtaking landscapes and quirky fly on the wall observations of the daily rituals of the local folk – I know I will flip through this book time and time again to admire these alone. Coming back to Olia’s insightful remark about the cover of the book, I feel that it’s not only her approach to cooking but the entire essence of the book that can be compared to the intricate mosaic: so many elements come into play, they are unique creations in their own right that can be admired and analysed separately, but then they come together to form a stunning portrait, a larger picture of a beautiful world. And just like the mosaic itself the longer you look at it the more of the new elements come to the fore, surprising you and promising an endless journey of discovery. I love pickles and ferments and so I always rejoice at how varied the range of them was at Russian food markets: traditional Siberian pickling techniques go hand in hand with (adapted) Korean as well as the Caucasian ones. When I was a kid it was impossible to tear me away from the market stall with Korean pickles, I marvelled at the variety of options, all different in colour and texture. Here the term Korean is used in a Russified or Soviet fashion. A large wave of immigration from Korea during the late-19th and early-20th century, passed through and settled in Siberia, leaving a strong culinary imprint which was of course adapted and modified over the years. So these dishes are a faint nod to kimchi rather than their direct off-springs. So here I am indulging my childhood obsession with Korean pickles and I hope you will join me! Massage carrots and cucumbers with salt in a ceramic or glass bowl. Set aside. Thinly slice the onion and fry in sunflower oil with chilli and Korean spice mix until softened (5 mins). Set aside to cool. In the meantime, mix minced garlic, sugar and vinegar and pour over the carrots and cucumbers. Mix in the fried onion. Cover with cling film and leave in the fridge for 2 hours. I just love checking in with myself, looking back a few years and thinking where I am at now. The reason why I love doing it is that it always brings as sense of satisfaction and accomplishment, of knowing that you have made progress and also gives you a chance to marvel at how coincidences can take you where you always wanted to be. These accomplishments can be small or major, but always meaningful to you. Try it, it’s quite eye-opening. The reason I am saying this here is that one of such marvellous moments is happening right now. Those who know me are aware of my MasterChef addiction. Watching all of the editions religiously for the past 7 or 8 years, I have seen so many incredible chefs and cooks, got inspired to experiment in my own kitchen, honing my knife and presentation skills, but all that time I have never dared to think that one day I might actually get to cook with one of these amazing talents. Some contestants inspire you and then fade while others really leave a long-lasting impression. The 2015 series of Professional Masterchef featured a contestant – Josephine O’Hare – who immediately evoked my admiration not only because she was the only woman to reach the semi-finals and an absolutely outstanding chef (as confirmed by the culinary giants on the show), but also the way she spoke about food and her love of cooking and feeding inspired a sense of keenness in me. Were it not for KinoVino, I probably would not have had any legitimate reason to get in touch with her (and would likely have sounded like a weird fan and Instagram stalker). So there we were having an incredible dinner (Gill Mellor’s residency at Salon Brixton) and chatting about film, food, cooking and feeding. Back then I was still shying away from the idea of cooking myself for they paying public and felt more comfortable filling the shoes of a curator and supper club host. For one reason or the other, our KinoVino plan has not materialised, while Joey and I continued to keep in touch. And finally, things have fallen into the right places. Joey and I will work together in the kitchen! As challenging as this seems to me, it is a real dream come true (or even ‘I could not even have dreamt about’) moment. Looking back at myself 2 years ago, I definitely marvel at where this new route has taken me and feel a great sense of accomplishment that I am where I should be. Joey and I share a passion for vegetarian cooking as well as for cultured foods (to me this way of eating is quite natural, having grown up in Soviet and then post-Soviet Russia on a diet of kefir, kvass and fermented vegetables). So when we got together to plan the menu for our upcoming supper club in partnership with Our/London Vodka, the dishes came together so naturally and harmoniously. I really can’t wait to cook with this inspiring woman and learn as much as I can from her. But before we get busy in the kitchen, I wanted to ask Joey a few questions about her approach to food and her journey as a chef. I’ve always loved food, and particularly big and bold flavours, and my mother was a wonderful cook for us as children growing up. I had a more complicated relationship with food in my late teens and become quite controlling, preferring to cook things myself. Luckily this interest in cooking transformed into something hugely positive, ultimately a career which I absolutely adore. What was the push to get a professional qualification as a chef? My first head chef at Rousillion inspired me to further my culinary qualifications with a degree from Westminster Kingsway – I had already been to Ballymaloe at this point, but it was great advice. Has your cooking style changed and how since you were on MasterChef? Yes – SO much! My god it would be brilliant to be able to do it again with what I know now. I’ve moved away from ‘cheffier’ food, in favour of lighter, vegcentric cooking. I’ve also discovered the beauty of working with fermented foods in the last two years and these play a role in my dishes. What attracts you to concept of fermentation and cultured food? For me fermentation is all about flavour. Yes there are numerous health benefits, and yes it’s a thrifty way to preserve a glut of something, but the complexity of flavour you get from the fermentation process is fantastic. I would go so far as to say that interesting vegetarian cooking, and vegan cooking in particular, relies on fermented foods, as these lend a complex flavour profile which can at times be missed. What are the key ingredients that you cook with? Seasonal vegetables are my go-to all the time! Their flavour is superior to anything out of season and it’s a better choice environmentally speaking. While I keep my veggies British and seasonal, flavour influences hail from all over. At the moment I am working with rhubarb almost non-stop, in both sweet and savoury dishes. What do you cook when you feel lazy? I love a good ‘fridge-forage salad’ and this is a breeze with jars of fermented vegetables to hand (another reason why I love fermentation!). I’ll use any odds and ends of veggies, throw in some leaves and some ‘smart carbs’ (I tend to have a little cooked spelt/quinoa etc left-over in a Tupperware), a good few handfuls of sauerkraut say, or spicy fermented cauliflower, and dress liberally with olive oil and live cider vinegar. It takes seconds and yet is something far more interesting than a simple raw salad. As a female chef, do you feel the industry has changed in terms of gender since you started? Yes, I think so. I think it’s better for us all, not just for women. But as a female cook one of the best changes has been the invention of Polka Pants! Chefs trousers for women which are comfy, functional and flattering! Why do you prefer working as a freelance chef rather than working in a restaurant? I like the flexibility of freelance work. At times I miss working with a team but I’m lucky enough to have planned lots of exciting collaborations this summer, and I find this a wonderful way to meet, share, and grow ideas, and to connect with other chefs. Do you think fermentation is a new trend that will pass or is likely to become a staple in our diet? Ooh – interesting question. I think the hype might dim slightly but ultimately it’s here to stay. It goes hand in hand with another current food ‘trend’ – a much closer consideration of food-waste – and both have staying power. We’re also only starting to fully understand the extraordinary role that the gut and biome play in our health, and fermented foods with their richness in probiotic goodness tap into this too. What is the best meal you’ve ever had? Hands down a recent dinner at L’Enclume with Felicity Spector. It was absolutely mesmerising. Every mouthful was sublime, and the dishes were delicate and beautiful. The connection to nature – and to Simon Rogan‘s farm not a mile away – was celebrated throughout the whole menu. It was head and shoulders above anything else.